History Channel will not cease from churning out various kinds of personalities through their programs, from the very interesting to the most bizarre ones. Tom Oar is one of the expositions of the channel through their television series, Mountain Men. Tom Oar is the likes of Life Below Zero‘s Glenn Villeneuve who left all forms of civilization behind, living their life in the jungle and surviving with whatever nature makes available to them. Let’s take a closer look at this weird man. You’ll be surprised to learn that Tom is not just in the forest struggling with meeting his daily needs. He’s got some serious business doing in there, and has made some good name and money too! Tom Oar was born in 1943 in Illinois, United States. The only member of his family known to the public is his father, Chike Oar who starred in the US Wild West shows which were performed between 1870 and 1920. Around the 1970s, Tom Oar ditched modern life and settled in Montana’s Yaak river valley with his wife, Nancy Oar. But prior their settlement in the Montana wilderness, Tom squatted with some friends in Troy and Montana while taking part in rodeo contests as a combo rider. He started combo riding in his twenties and did it for quite many years before quitting for health reasons. Oar then left for one of the remotest parts of Montana with his wife, basically in the woods. There, they built a cabin and settled about 50 miles away from the nearest food shop. Of course, they have no pressing need for groceries because they hunt, gather and make their own food every day. 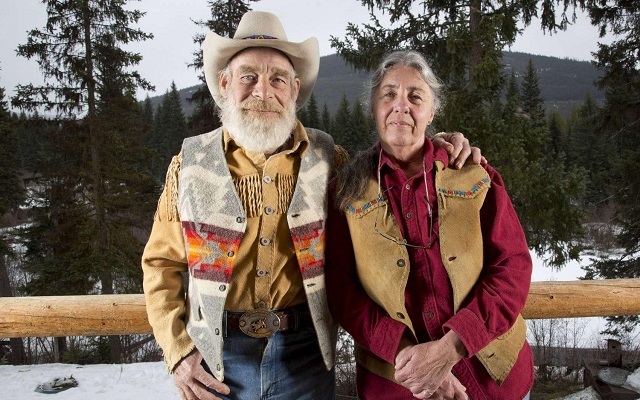 As for their daily occupation, Tom and his wife Nancy keep themselves busy with making various kinds of shoes and clothing such as moccasins, jackets, shirts, and trousers from tanned deer skins. They sell the products, all of which were handmade, whenever they attend any occasion in town. They also receive numerous orders for the products which they scarcely meet up with. Although he received no professional training, Tom Oar is rated as one of the highly esteemed animal skin tanners in the U.S.
Tom Oar has three children with his wife Nancy. They are Chad, Jack, and Keelie Oar. There is no detailed information about them except that they stay in Chicago, Illinois. Well, Tom Oar has been doing his business and living his life quietly without much notice until the creators of Mountain Men discovered him. They cast him alongside major characters Eustace Conway and Marty Meierotto with Rich Lewis, Morgan Beasly, Jason Hawk and others joining in subsequent seasons. Tom Oar’s wife, Nancy Oar are among the numerous minor/guest characters who also appear on the show. Their three children have also made appearances on the show. Mountain Men is an adventure show that documents the daily life of brave individuals who live their lives in peril against dangerous beasts and harsh forces of weather. It first aired on History Channel on 31st May 2012. Tom Oar has an estimated net worth of $200,000. A good part of his net worth comes from his pay packet for his role in Mountain Men. Tom also makes good money from his tanning business, sales of hides and its products. Chances are that Oar could have other assets unknown to the media. Tom Oar stands at a tall height of 6 feet and weighs about 80 kilograms. Of course, no mini-stature individual would dare venture into the kind of life that Tom has chosen for himself. He definitely needs a good height and weight to enable him to withstand the intricacies of sharing his neighborhood with savages! And he’s got all it takes both in height and stature. In addition, Oar has a well-trimmed athletic body that he has maintained even into his old age. Certainly, living without any labor-saving device equals being physically fit. This is simply because the only tools he has for getting even the most difficult task accomplished remain his bones and muscles! His signature cowboy dress code complete with a hat compliments his lifestyle.